Find Experienced Roofing Companies in Northwest Indiana on the web. Your house could be your biggest investment. To protect this investment, you need to have a good roof. In today’s fast-paced world, you have no excuse to put off roofing repairs as finding professional roofing companies in Northwest Indiana is possible with just a click of your mouse. In the past, when you needed repairs carried out to your roof, it was a case of going through the phone book and hoping you would, with luck, find a quality and affordable contractor. Alternatively, you could ask relatives, friends and neighbors if they could recommend one. Any one of the previous methods was not a guarantee that your roofing would be repaired effectively. Circumstances today have changed for the benefit of homeowners, with the facility of the Internet. 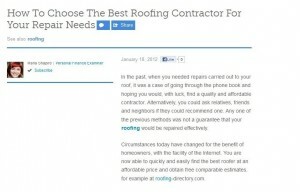 You are now able to quickly and easily find the best roofer at an affordable price and obtain free comparable estimates, for example at roofing-directory.com. Roofing repairs should not be ignored. When neglected, a simple problem may worsen in time and may cost you more. If your roof deck is sagging or if there’s a dark spot on the ceiling that clearly show signs of water damage, you have to act quickly to avoid further damage. A dependable roofing contractor like Rogers Roofing can provide you with the right solutions. One way to find an expert roofing contractor is by searching for roofers in your area through the National Roofing Contractors Association (NRCA). The site also features company profiles, including information about the types of services they provide (residential, commercial, or both), years of experience, and whether or not they have insurance and the necessary licenses needed to operate. Other than roofing repairs, also pay attention to your windows. Check for leaks and have them repaired immediately. Windows in good condition provide good insulation and increase the energy efficiency in your home. Not all roofing contractors are like Rogers Roofing, because we also offer quality windows for Hammond, IN clients and customers throughout Northwest Indiana. To find roofing and window contractors alike, you can check for reviews on sites like Google, Yahoo, Yelp, and Angie’s List. These sites usually have online forums where ratings, reviews, and recommendations are posted by previous clients. It is also a plus if the roofing or window company is accredited by the Better Business Bureau, a non-profit organization that aims to promote high business standards.